Etching, aquatint, spitbite, photo etching, hard-ground and polymer gravure printed with Charbonnel etching inks in colors, a fine, fresh impression of the only known state, the full sheet, printed on Hahnemuhle Baryta 350gsm bright white paper, with margins, hand-signed, dated and numbered in pencil by the artist, executed in an edition of 50 examples (there were also 10 artist proofs, 3 printers proofs, 1 BAT proof and 1 archive proof), printed by the artist with the assistance of Peter Kosowicz at Thumbprint Editions, London, published by World House Editions, Middlebury, Connecticut, in fine condition, unframed. What is immediate in the present work is a network of grids, lattices and pathways that, although subtlety present in the artists’ earlier work, are now more formal and prominent. 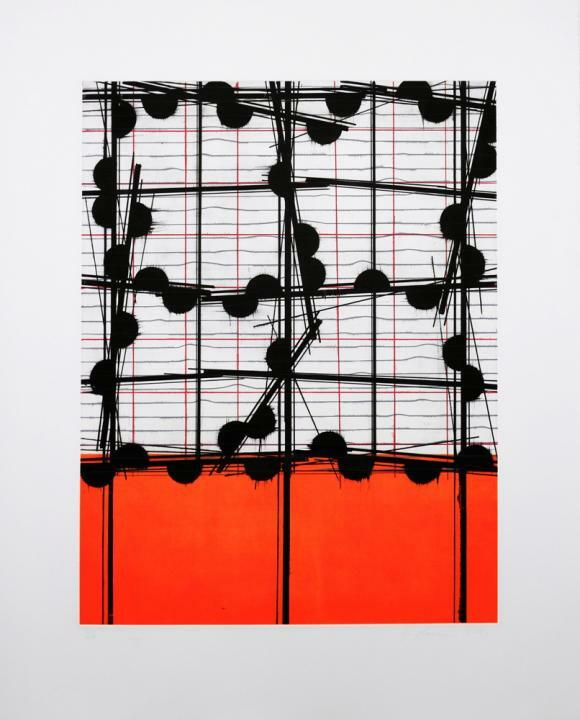 Mark Francis’ new prints convey a strong sense of geometry, structure and in a sense, a degree of mapping with their dominant horizontal (longitudinal) and vertical (latitudinal) lines. Drawing from the new stylistic direction in his paintings and drawings, the new prints by Mark Francis have been inspired by the artists’ residency at the Institute of Astronomy at Cambridge University, where he spent “quite a lot of time” in the library looking at diagrams of planetary systems. Whereas the earlier work had its formal tension broken by cells, microbes and synapses, the newer work has more of a dialogue with minimal painting - from the micro to the macro. The formal mapping structure of the work is now dotted with what could interpreted to be stars, somewhat akin to a constellation, which break the formal tension of the geometry. Upon even closer inspection, a painterly field exists below the surface of the grid, a cosmos perhaps, creating a push-pull affect and trapping the viewer’s gaze.